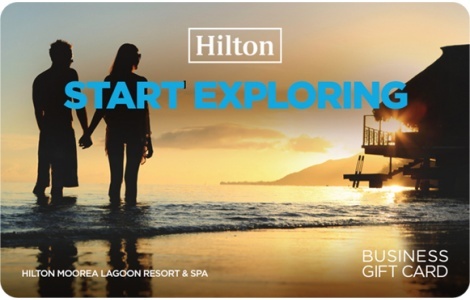 Give the gift of travel with a Hilton Business Gift Card! The Gift Card can be used at on-property restaurants, retail shops, golf courses, and spas, and can cover any charge to the room. The card is accepted at over 5,000 hotels and resorts within the Hilton Portfolio. Plus funds do not expire! The Hilton Business Gift Card may be used only at Hilton Hotels and properties worldwide that accept American Express® Cards. Funds do not expire. The Card cannot be used at ATMs. Not redeemable for cash, except where required by law. Additional limitations apply, including restrictions on the use of the Card at cruise lines and for recurring billing. Additional Terms and Conditions may apply. See Cardholder Agreement for complete details at AmericanExpress.com/HiltonBizTerms. This Card is issued pursuant to a loyalty, reward, or other promotional program. This Card is issued by American Express Prepaid Card Management Corporation. American Express is not responsible for the fulfillment of this promotion.